Wow, it wasn’t that long ago that I did a review of 7.0 for Model S’s without autopilot and now Tesla 7.1 is here! Tesla is on a roll. Let’s get to it. Below i’ll cover each of these. This is one of the features I was the most eager to get, but it has also been the most disappointing feature in 7.1. It is supposed to auto-open your garage door as you arrive home (if enabled) and can also optionally (only if auto open is enabled) auto-close the door when you leave. In case you were wondering, it will not auto open the door and then close it after you pull into the garage. I assume this is for safety reasons although it would have been cool. I tried for almost an hour to get it to work reliably — my neighbors must have thought I was nuts! In that hour it worked just once and opened the door on arrival. It never auto-closed my garage door when I left. From playing with it it seems related to GPS accuracy or a location related problem although I think they also have a problem with how long they send the signal for. 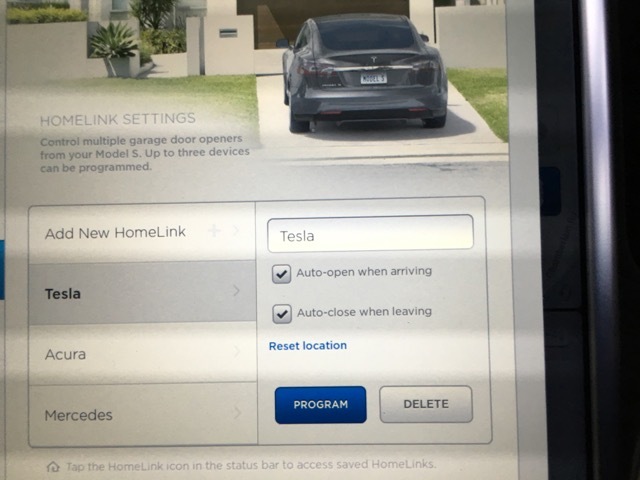 The Homelink settings have a way for you to reset the location and I tried that in many different locations on my driveway but it seemed to still get confused as to when I was home or not home. It actually was more reliable for the location for Homelink before this update — now I can pull up to my garage and at times (seemingly randomly) it doesn’t think i’m anywhere near it (Homelink icon not green). I think this area will need significant work. This is supposed to use Tesla’s ambient light detection and your preferences to be smarter about the brightness you want. To be honest, i’ve been happy with a fixed setting since I got my car and haven’t wanted something in this area, but evidently others thought something was needed here. I enabled it but didn’t notice anything immediately different. This will give you live updates on Superchargers if they’re offline and the details around the issue. This is a great addition and being able to know and see the state of the network will further help with trip planning and range anxiety. I couldn’t find any Superchargers in a broken state so I couldn’t test this yet — Tesla does an amazing job keeping Superchargers up and working. My clock and temperature are back! Thank you Tesla! I really wish you had left the temperature at the top of the 17″ too so the passengers can see it but i’ll take this. Another update they made is the analog clock widget now has a blue second hand that is active which makes it a “less dead” widget. I still don’t find much use for that widget, but it is my default for the left side of the dash when navigation isn’t enabled. Tesla added several options here around how your car locks and unlocks. One is around locking or unlocking the driver’s door only or all the doors. They even updated the FOB functionality so you can unlock just the driver’s door or all doors depending on the setting. Another option they added was control over unlocking automatically when you put the car in park. I turned that off as it was an option I wanted. What I like is you can now park and not unlock all your doors which could be a safety concern. If you still want to park and unlock just hit park twice. This was intuitive and worked as you’d expect. You can also now unlock the car without interrupting charging. They finally fixed the “Charge for 0 minutes” type stuff and the trip planner will actually now allow charge remaining numbers less than 20%. Amusingly, they still list Trip Planner as Beta. How many million miles or thousands of trips will we have to make before Trip Planner leaves Beta status? I found immediate improvements for my regular long trips. Trip planner no longer takes me to the first to a Supercharger near my house before continuing on the trip. Also, the stops were much more reasonable. I still wish I had an option to avoid certain Superchargers. It loves the Greenwich, CT Supercharger and I really don’t like that one and there are other good options. They made some other small, but nice, improvements too. They improved the automatic windshield wiper behavior (I haven’t experienced this yet but its looking like i’ll have a chance tomorrow :p) and they now let you pause audio when park assist is on the display which seemed just like an oversight before. What I thought we were going to get in 7.1 was a larger visual update to the 17″ interface along with a number of small things. I suspect that slipped out of 7.1 into 7.2 and we got the AP improvements which were more urgent along with a few nice improvements for everyone else. This was a quick and solid update for all owners and shows that Tesla is listening to the owners. The autopilot owners got additional improvements in 7.1, some that they’ll like, and some that they may not. It will be interesting to watch their reactions to 7.1. What were you expecting in 7.1? What do you think about the updates? Let me know in the comments below. I am surprised you have had trouble with the Auto Open/Close. I’ve used it about six or seven times already and it’s been flawless. I took video of it for friends. This is when I’m using it and no problems. Are you maybe trying to use it without really going anywhere? I noticed that it starts with auto-open, but wouldn’t get auto-close until the car turned off and I closed the doors (screen off), and then got back in and drove home. Similarly, if I go home and it auto-closes, then I have to get out the car, close the door, then get in and it picks up auto-open. You can see the text in the Homelink pop up/drop down change when the car decides what it will do. Plus you get a “skip” option if you don’t want it to trigger. For me, that is great if I’m driving with one of the other people in the house as my garage is such that I need to pull out before they can get in. Thanks. I tried driving down the street and back. At home I tried getting out and back in to no avail. It didnt work for me “out of the box” and there seems to be some hidden rule I’m not hitting. Perhaps It has to shut down or lock on each end or something like you said. I see the pieces there but they just don’t work for me. Auto opens upon arrival, but will not auto close on departure for me. Today my open/close was oddly reliable. Hoping it stays that way and trying to figure out what changed! Same for me. When I departed this morning the garage door didn’t shut (as normal over the past few days). This evening when returning home it opened and after a couple of hours I left the house and it magically worked.